The Israeli-Palestinian war has been called the worldâ€™s most intractable conflict. It is by now a commonplace that the only way to end the violence is to divide the territory in two, and all efforts at a resolution have come down to haggling over who gets what: Will Israel hand over 90 percent of the West Bank or only 60 percent? Will a Palestinian state include any part of Jerusalem? Clear-eyed, sharply reasoned, and compassionate, One Country proposes a radical alternative: to revive an old and neglected idea of one state shared by two peoples. Ali Abunimah shows how the two are by now so intertwinedâ€”geographically and economicallyâ€”that separation cannot lead to the security Israelis need or the rights Palestinians must have. 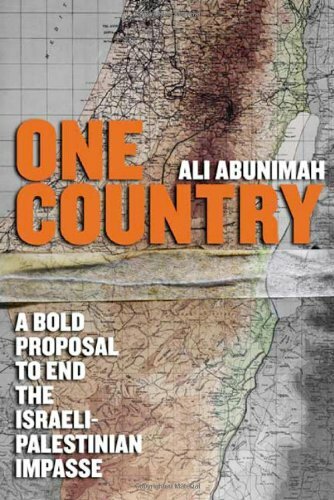 He reveals the bankruptcy of the two-state approach, takes on the objections and taboos that stand in the way of a binational solution, and demonstrates that sharing the territory will bring benefits for all. The absence of other workable options has only lead to ever greater extremism; it is time, Abunimah suggests, for Palestinians and Israelis to imagine a different future and a different relationship.